A gaggle of women in brightly colored saris choose snacks from shelves behind a long counter, their dark eyes widening as bags of goodies change hands. I watch the gulab jamon man to one side pouring a thin ribbon of saffron-yellow batter onto hot oil. He works his funnel quickly, creating a pattern of looping swirls the length of the wide cauldron. The sweet smell of sticky honey hangs in the air. As he deftly flips the puffed dough with a wire implement he chatters in Punjabi to a man standing next to him. Families in freshly laundered clothes crowd the sweet shop’s doorway, jostling for position. At a café nearby tables sporting hookahs spilled out onto the dingy sidewalk. Around each table sits a group of young people smoking shaggy bricks the size of sugar cubes which nestle in glowing brass bowls. Snaking ropes connect the mouths of the partakers who let out dribbles of smoke from around their mouthpieces and lean back against spongy cushions with broad Cheshire cat smiles. ‘Shisha,’ our friend’s son tells me with a glint of his 16-year-old eyes. ‘Comes in all sorts of flavors: blackcurrant, mango, coffee. That’s what I want to try,’ he said in his strong accent and then – looking at his mother as if having said too much – he darts off down the street. You might be forgiven for thinking that we Bullhogs were on a street in, say, Mumbai or New Delhi. But this all took place in Manchester, in northern England. If it wasn’t the best Indian food experience we had on that trip (that honor would go to Kayal in Leicester), Manchester’s Curry Mile was certainly the most entertaining. 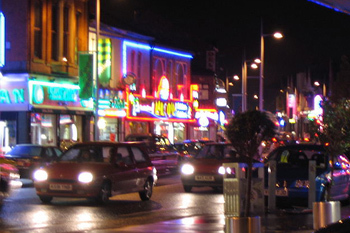 With some 70 curry and kebab houses to choose from, this stretch of Wilmslow Road claims the highest concentration outside of the Indian subcontinent. On that warm summer’s evening the constant flow of the ethnically diverse population surely transported us. At clean and spacious Shere Khan, my friend Roy’s face turned red as he began to sweat from the heat of his Madras curry. I got up to find him another napkin and was delayed by the sight of a large brazier to one side of the kitchen. At its massive rectangular grill, a tall man in a turban stood slathering a spice and yogurt mixture onto skewers of chicken and lamb. As the meat sputtered and popped fantastic smells rose on the sweet smoke. The man met my eye and gave me a knowing smile. Back home in Seattle, I marinated chicken in yogurt and spices before cooking the skewers over a very hot fire, just the way that man did. The smells wafted up around me, smoky and spicy at the same time, and the resulting texture was sensational. And I decided that even though I was far from India – and even far from the Curry Mile – I was close to Nirvana. Yum! Here’s what to do. Tandoori spice note: World Spice Market here in Seattle sells a fresh curry mixture called Tandoori Spice, which is what I use. In place of red food coloring, their mixture uses mild paprika. You can mix your own Tandoori spice with mild curry powder and paprika in equal portions, and add a bit of cayenne if you want more heat. Marinate the chicken for 4 hours: Trim any fat from the chicken thighs and cut each one into 3 or 4 pieces. Set aside one heaping tablespoon of the spice mixture for later. 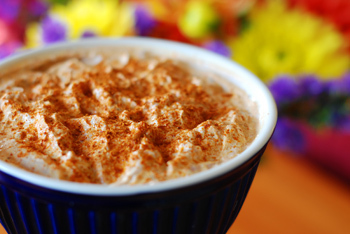 Mix the yogurt and the rest of the tandoori spice in a medium-sized bowl. Put the chicken into the yogurt mix and fold so that all the pieces are well coated. Cover with plastic wrap and let marinate for 4 hours or longer. Get the grill HOT: A charcoal grill is best for this dish. Mine is a little Smokey Joe from Weber, which puts the grill surface about an inch and a half from the coals. Perfect! Light 40 coals and let the pile burn for 20 minutes. Spread the hot coals out, add 10 fresh coals and put the grill surface in place. Ten minutes later you’ll be ready to rock and roll. 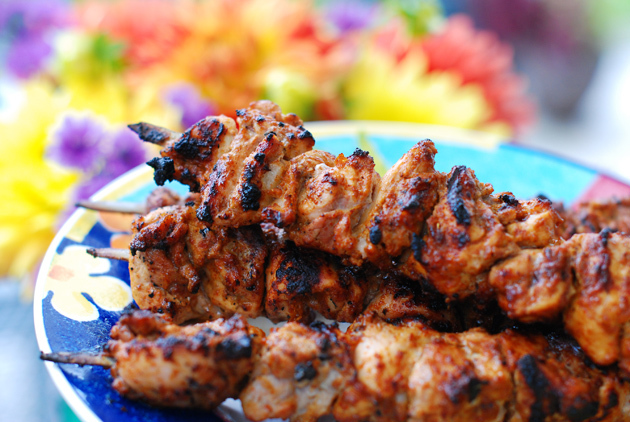 Thread the skewers: Distribute the chicken evenly onto 4 metal skewers and spread any yogurt mixture that stays in the bowl onto the meat. Sprinkle the top side of the meat with half the leftover Tandoori spice and salt and pepper generously. Drizzle 1 teaspoon of the oil onto the meat as well. Grill the meat: Scrape the surface of the grill clean if necessary and wipe with a bit of oil, if desired. Put the meat top side down onto the hot grill. Now sprinkle the meat with the rest of the Tandoori spice and more salt, pepper and oil. If the charcoal flames a bit, ignore it. Grill the skewers for 2 minutes before turning. If the meat wants to stick, use a metal spatula or tongs to free it. Grill the other side for 2 or 3 minutes and then turn the meat ¼ turn to grill the undercooked sides for a minute or two. Depending on the heat of your grill, the chicken will be cooked thoroughly in 8-10 minutes. 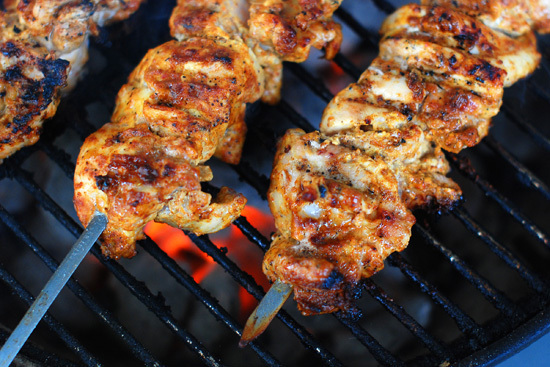 For best results, shift the positions of the skewers to alleviate any hot or cold spots on the grill. Whatever you do, resist any temptation to put the lid over the grill. The chicken will grill perfectly without it. Nice. I love the tandoori spices on chicken. I also use yoghourt to marinate chicken often but should try your recipe this time. Mmmm.. I love Tandoori chicken! Thanks for sharing! I adore World Spice Market. That’s where we got our harissa (it’s been awhile). I’ll have to add tandoori to our list! I see this chicken and my mouth starts to water. I can just imagine the flavor and the smoky grill aroma…MMMM! You have inspired me to try this. I love tandori,these looks delicious is a great recipe,a lot of good ingredients in it. Oh! These chicken look so good, love the spices and the color. Those chicken skewers look amazing. I need to branch out my grilling to include more Indian and Asian foods. Thanks for sharing the recipe. No food coloring ! a BIG plus and beautifully done!! Loved the post.